Many lovers of Sherlock are reluctant to see the merits of Elementary, and many more find it hard to watch. Me, I enjoy it as a fun weekly thing, though I do understand such sentiments. 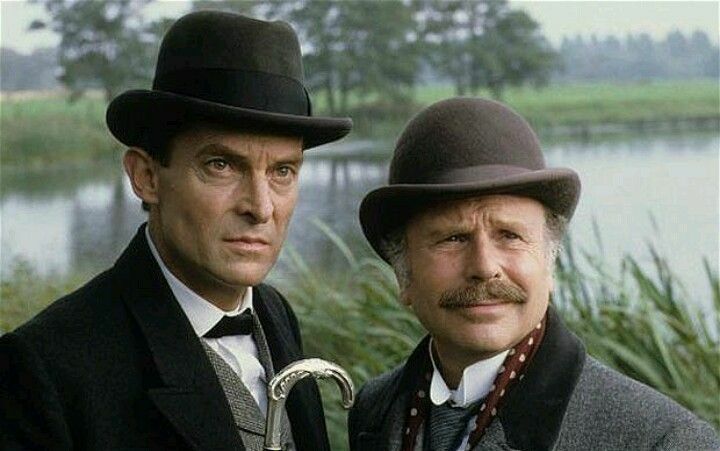 But you’d be hard-pressed to argue that the original British Holmes series, starring Jeremy Brett (Sherlockian circles nickname it ‘the Granada series’ to distinguish it), is anything other than one of the most stellar Sherlock Holmes adaptations you’re likely to find. 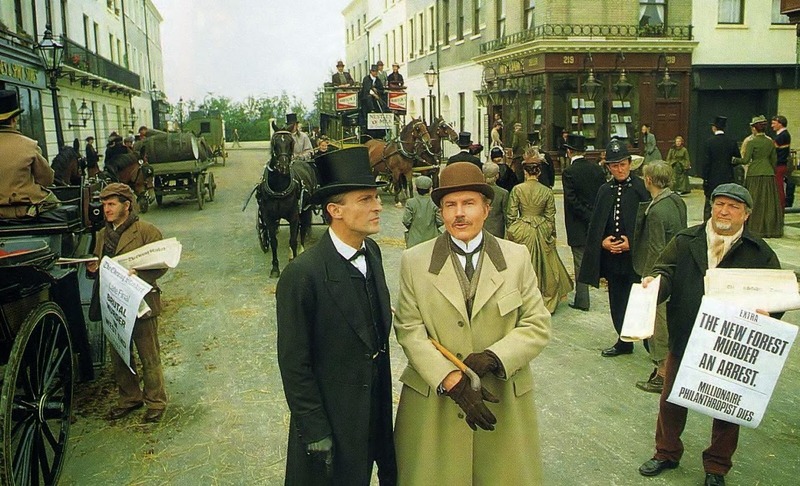 The Granada series is in fact my favorite Sherlock adaptation, despite its flaws. Though the series has been (ostensibly) yoinked from YouTube, it is still readily available at most libraries, and for purchase on DVD. The following is why (in my professional opinion) this series is worthy of sitting on your shelf next to the Sherlock boxset. There are two actors who play Watson in this series: the first, David Burke, is the perfect solid, dependable, intelligent doctor we know and love from the books, with just the right dash of comedy relief. He’s not the bumbler that Nigel Bruce was, but he isn’t above putting just a little funny into his Sherlock foil. A good example of this is in “A Scandal in Bohemia,” where he returns home hungry and all he can basically focus on is eating. Another lovely Burke moment is in “The Red Headed League,” the famous scene where Jabez Wilson’s story makes him, and then Holmes, crack up into gales of laughter. The second Watson, played by Edward Hardwicke, is a Watson with more gravitas. It’s a perfect transition, as Hardwicke takes on the role first in “The Empty House,” and so his slightly older look and more subdued performance works perfectly as a Watson post-hiatus. 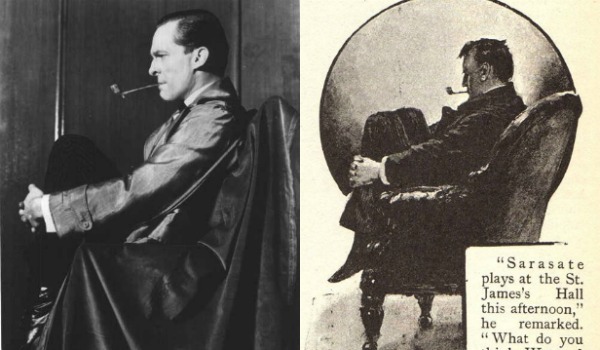 Hardwicke nails the character, and also played Watson in the stage play with Brett’s Holmes, as well as narrates several Sherlock Holmes audiobooks. He was Brett’s good friend in real life, and the real relationship shows in the chemistry between the two. The Granada series captured the Victorian England setting brilliantly in not only its sets and locations (both of London and of country settings), but especially in its costume and prop design. The attention to period detail is incredible, and thereby immersive: we feel, watching this series, as though we’re there in that time period, or better still, there in the books themselves. If there can be said to be one flaw in the Granada series, it’s the later episodes. This is because Brett’s health is very obviously failing him. As great as his acting still is, the medications he was on caused bloating and weight gain, and visibly slows down his previously boundless, explosive energy. In some of the latest episodes, you can clearly hear the labor in his every breath, and can see the pain in his eyes. Because of this, the later episodes are very hard to watch for the most part (“The Cardboard Box” and “The Hound of the Baskervilles” are two that are watchable), and that, coupled with some pretty terrible writing in a few of the episodes, makes the series only partially rewatchable. This shouldn’t deter you from the experience, however: the superior quality and the fantastic faithfulness to canon, plus the sheer fun, far outshines any flaws in the later installments. This series is my favorite, ranked up there with Sherlock. Watch the Brett series and see why. And then tell us about it in the comments! 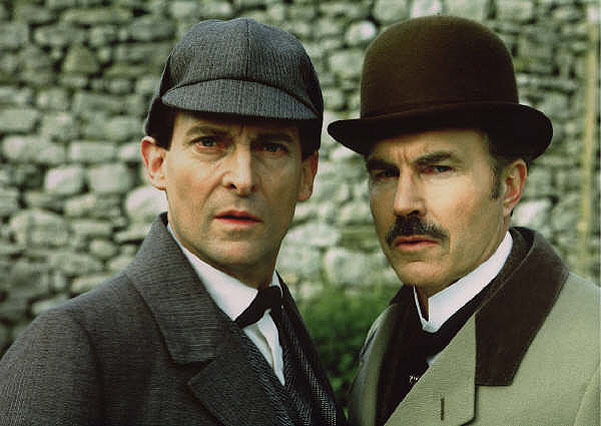 Here’s why Sherlock fans should watch the Basil Rathbone films and Elementary. My latest two cents’ worth for Sherlock’s Home. My husband and I were faithful watchers of this series. We loved the acting, the attention to detail, everything. 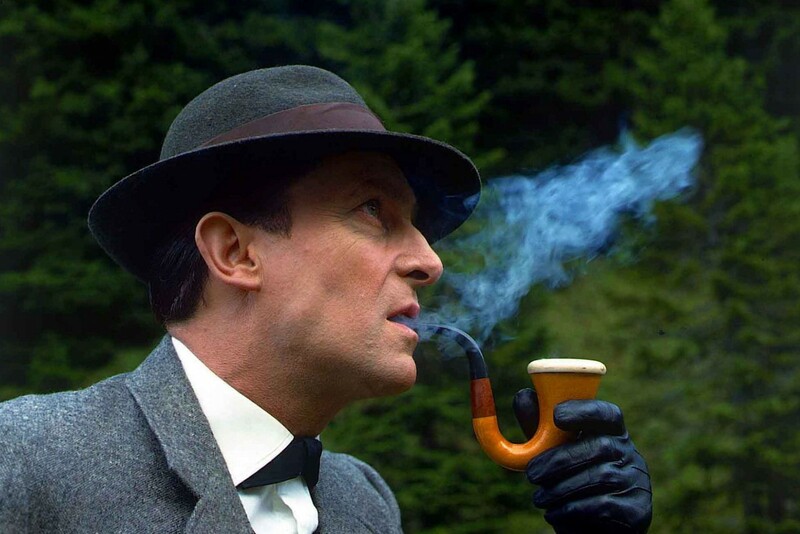 Jeremy Brett will forever be my favorite Sherlock Holmes. I grew up reading Sherlock Holmes, and then in the evenings watching this series with my Father. The Granada series brought Sherlock Holmes to life in ways no other series has ever done before or since. Yes, the current BBC Sherlock is amazing and a joy to watch, but nothing will compare to Brett’s version of Sherlock. He will be forever MY Sherlock. When I first discovered Holmes, in junior high school, I thought he was a real person and looked like Basil Rathbone. Initially, I was reluctant to watch the PBS series, but once I started in on it I was hooked. 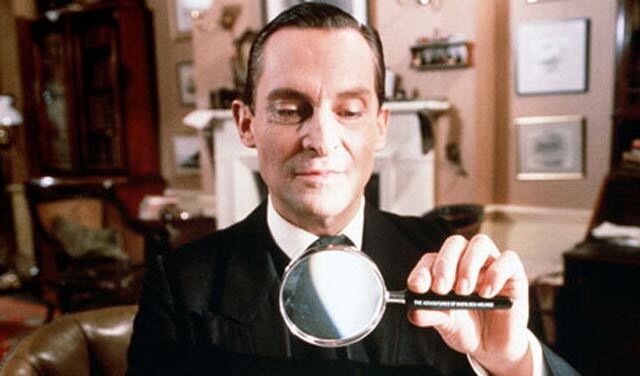 Sherlock Holmes no longer looked like Basil Rathbone; he looked and sounded like Jeremy Brett. Of all the interpretations, his is the most evocative of Holmes, and he brought the character to life in a unique way. I really couldn’t agree more with this article more. The Granada series is the best and most faithful adaptions of the cannon and I believe will remain so. It is a shame it went the way it did, due to Jeremy Brett’s ill health. The most tragic thing about this whole series it you are in the end watching this incredibly talented and definitive Holmes slowly die and you cannot help but feel sorry for him while watching it. My advice to anyone starting with this series is to start at the beginning while the series and Brett are in their prime and cannot be topped.